Back in late July 2011 it appeared that the Federal Government would o what it had never done, default on the payments for the National Debt. I was in Washington that week and could not believe what had become of the country. For me it was a week that I remember well because on a nighttime picture taking expedition on the National Mall I fell off a darkened ledge at the Washington Monument while turning to line up another picture while walking in the dark. That week I wrote a number of articles on my observations of what was happening. Since it appears there is a strong chance of the dreaded “Sequester” occurring in a bit over 48 hours I am posting those articles in their entirety here along with the links to the articles on this website. As a historian and serving Naval Officer I really have a hard time believing what is happening in our government. I can only imagine it is the same kind of feeling that officers in service in 1860 and 1861 felt as their families, friends and the elected officials home states were pushing the country into the abyss. Unfortunately now, as it was then there is enough blame to spread copious amounts between politicians, preachers, and pundits the Unholy Trinity of both parties and across the political spectrum. Men, women and institutions that care more for their special interests than the country that gives them the opportunity to achieve great things. These are my writings from that unfortunate week in our history. Unfortunately nothing leads me to believe that anything has changed since then and that the leaders of both of our political parties and their supporters in their respective media, corporate and lobbying interests and partisan pundits and preachers on both sides will not do all they can to ensure the ruin of this country. God help us because I do not believe that our leaders have the capacity in themselves to do anything. Today was another good day, in fact really good day at the conference I am attending with the George Washington Institute for Spirituality and Health. At lunch I was able to spend some time with my former commanding officer at Marine Security Forces. It was good to see Mike again. He and I went through some very trying times together and I treasure his friendship as well of that of his family. I think that of all the commanding officers that have served under which have included some incredible men that he was the best. We are a lot alike in many ways both rather cerebral and out of the box thinkers. We basically are the same generation as far as military service goes, when he was a young Marine Corps Officer I was a young Army Officer. We reminisced about the way the country was back then how our leaders still worked together and even if we disagreed with the policies of those in the opposing party that we still knew that we were Americans and that at the end of the day we were friends. I guess that Mike and I are dinosaurs now; we tend to look at the big picture and both being career officers of the same generation have seen the country change. We both entered the military during the Cold War and after the loss of Vietnam. Our teachers were the men that served in that war, those who came home to a then hostile country. Neither Mike nor I are service academy types nor the products of conservative military schools, Mike went to Harvard and attended Navy ROTC and I went to a California State University School, CSU Northridge and took Army ROTC at UCLA. We both come from strong yet tolerant religious traditions and were influenced by chaplains early in our careers. Mike’s academic background is Economics mine Theology and Military History and both of us hold advanced degrees in those subjects. We both graduated from the Marine Corps Command and Staff College. We have both served overseas and in combat. We love our country and treasure our military service and that of the men and women that we have served with over so many decades. I am honored that Mike will administer the Oath of Office when I am promoted on September 1st at Harbor Park in Norfolk Virginia. By the way Mike loves baseball too and being from Boston he is a Red Sox fan. His dad, a die hard fan died a few months before the Sox broke the “Curse of the Bambino” in 2004. My dad died a few months before his San Francisco Giants won the World Series in 2010. Talking with Mike today made me think back to a time when things were not like what they are now, where political opponents were simply opponents and not “the enemy.” I shared with Mike the terms the German Military used in the Second World War to describe those that they fought against. The Western Allies were “die Gegener” or simply opponents and for the most part the German military observed the Geneva Convention and Laws of War when fighting the Americans, British and French. However with the Soviet Unionit was different. The Soviets were “Der Feind” or the enemy. As divided as we were in the 1970s and 1980s there was still a modicum of respect for the other side and ability to work together when we needed and Mike brought up the relationship of Ronald Reagan and Thomas “Tip” O’ Neill, vigorous political opponents who remained friends. However there is today and has been for the past 20 years or so for members of the extreme wings of both major parties to identify their opponents as “enemies.” The language difference is significant. An opponent is a adversary that you hope to defeat but there is not a hatred involved and when the competition ceases the opponents remain friends and even colleagues even as they prepare for the next “game” so to speak. Enemies are another matter. To be an enemy is to assume that the other side poses an existential threat to your side or your agenda. Thus there can be no compromise and the opponent is not simply to be defeated but destroyed and annihilated much like the Old Testament when the Israelites were commanded by God to kill everything even the babies and pregnant women. So much for being pro-life but I digress…. 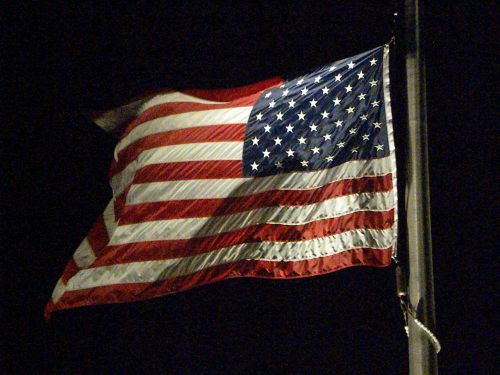 Today we are more divided than any time since the Civil War, blood is boiling and if there is compromise it will be a mere truce until the next round of political bloodletting which if we are not careful may become actual bloodletting and the enemies allow their unbridled hatred of each other spill out into open conflict. Such affairs never end well and if we remember our history our Civil War’s military conflict was over in a few years and yet with the relatively primitive weapons of the ay killed more Americans than any other conflict. The after effects well, frankly Scarlett took over a hundred years to recover from and I would dare posit that some believe that the war is not yet over. Tonight I went to dinner alone cancelling my plans to head out to watch the Nationals play the Marlins. I needed the time and solitude and somehow a trip on the DC Metro seemed the last place that I would find it. I walked to the Gordon Biersch where I had dinner, drank a few beers and watched the Orioles beat the Blue Jays. 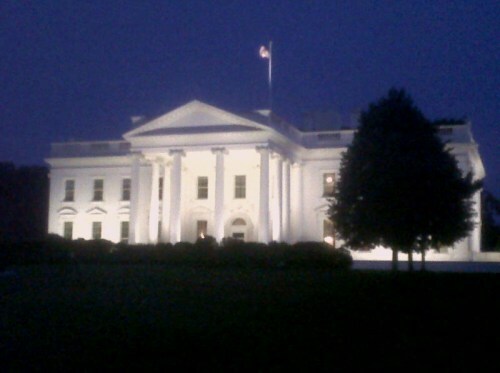 After dinner I detoured from my normal route back to my campus housing which takes me in front of the White House. Amid the lights and the amazing splendor of the buildings adorned with American and District of Columbia Flags I walked and simply observed people. Tourists from across the nation and the world were taking pictures, business people and government workers hurried about, vendors hawked their patriotic wares, mostly made in China I might add or snack foods. Here and there a protester sought to draw attention to their pet cause, there is the anti-nuclear weapons protestor that has been camped across from the White House since 1981, people demanding to see the Birth Certificate, those protesting for the removal of various Arab dictators and others peppered about. Capitol Police and Secret Service officers were out in force and amid the fortress like surroundings of many government buildings and the offices such as the World Bank and major business and financial institutions armed police and private security stood watch with cameras watching every move. 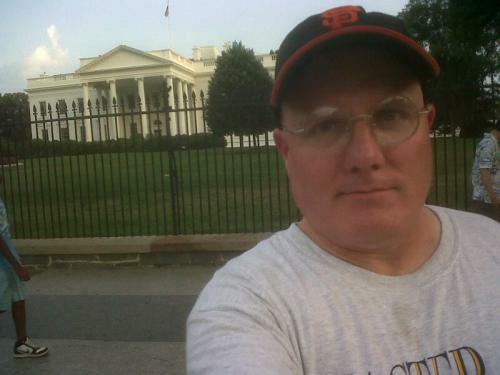 When I passed the White House I was rather down. So I decided to walk the monuments that adorn the Capitol Mall. 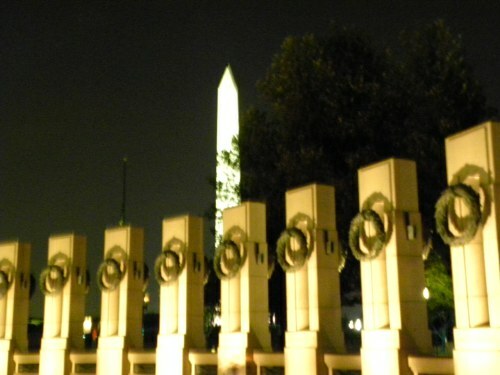 I passed the Executive Office Building and Washington Monument and crossed the street to the World War Two Memorial. At each place I paused before I continued to walk into the night. 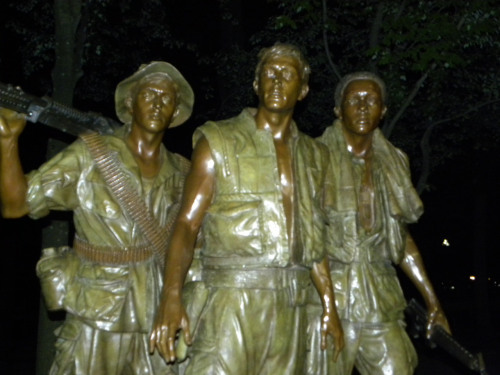 I then stopped by the Korean War Memorial and the Vietnam War Memorial, the stark reminder of the men and women killed and missing in that war as well as the rip in the fabric of the nation that I am not sure we have ever gotten past. 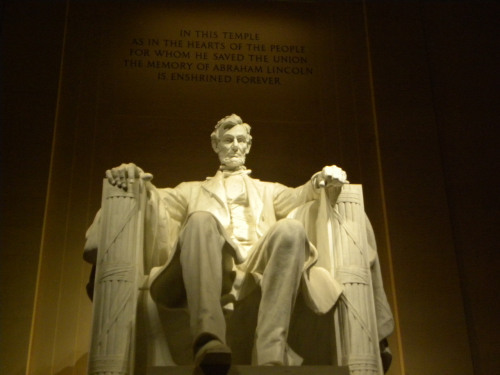 I then went and paused before the Lincoln Memorial and I thought of the immortal words spoken by President Lincoln in his Second Inaugural Address shortly before he was cut down by a bullet fired by John Wilkes Booth. They are words of reconciliation spoken even while Americans fought Americans in the last months of the war. Fellow-Countrymen: At this second appearing to take the oath of the Presidential office there is less occasion for an extended address than there was at the first. Then a statement somewhat in detail of a course to be pursued seemed fitting and proper. Now, at the expiration of four years, during which public declarations have been constantly called forth on every point and phase of the great contest which still absorbs the attention and engrosses the energies of the nation, little that is new could be presented. The progress of our arms, upon which all else chiefly depends, is as well known to the public as to myself, and it is, I trust, reasonably satisfactory and encouraging to all. With high hope for the future, no prediction in regard to it is ventured. As I walked through the warm and humid night air I imagined what it must have been like for officers of the United States Army, Navy and Marine Corps as the nation split in 1861 with many Southerners leaving the service to enter the service of their own states. Many tearful goodbyes were spoken by men that had served together in war and peace and on the lonely frontier of the nation, men who in a few moths time would be commanding American armies and killing their fellow Americans. My family fought for the South being from Virginia. I cannot say that I would have done different like them and so many Southerners or if like General George Thomas of Virginia I would have remained with the Union incurring the wrath of his family for the rest of his life. Since I have never taken my Oath lightly I can only imagine that I would have done what Thomas did even if it meant the loss of family. Today I fear that even if our leaders can avert a default on or debts that they have now set the stage for worse I the coming months and years. The open hatred and contempt of our leaders for one another and the ideas that each stand for has wounded the nation more deeply than any default or government shutdown could ever do. This is not simply partisan discourse it is a deep enmity and hatred that has not been seen in this country for 150 years. If cooler heads do not prevail soon the damage may be irreparable and the consequences more terrible than we can imagine and why anyone would willingly continue down this road is beyond me, but hatred does terrible things to people and nations. Since it was nearing10 PMI hailed a taxi by the Lincoln Memorial. I entered into a conversation with the driver, an immigrant from Morocco who has been in the United States 22 years. I mentioned my concern and he was far more hopeful than me. He said he believed that a shutdown would be averted. I love immigrants especially recent ones who have left home and family to become Americans. My dad’s side family has been in this country since 1747 and my mother’s even longer. It was inspiring for me to hear this man still be in awe of this nation despite all of our troubles. When I left the cab I thanked him, gave him a decent tip shook his hand and in my woeful Arabic said “Assalamu alaikum” or peace be unto you. As a historian I tend to see the dangers in what is happening in our country and I do have legitimate concerns, but when I hear the words of hope and awe that this country engenders in those who come here to be free I hope again in spite of myself. I was reflective tonight and thinking about all of those great men and women who sacrificed so much to the sake of this land and also the world as I walked the capitol late this evening. As I saw the flags around the Washington Monument at half staff in honor of former Chairman of the Joint Chiefs of Staff General John Shalikashvili my thoughts turned to the words of America the Beautiful. Today was another very good day in regard to the conference I have been attending at the George Washington University Medical School Institute for Spirituality and Healthcare. Today was a day to practice what we have earned so far with men and women that are employed by the Medical School as “model patients.” These are people that work with medical students before they even see a real patient and that simulate what the students might encounter when they actually start seeing patients as senior medical students and then as in their various internships and residencies following graduation. I was very enlightening as we had the chance to be the physician in our encounters with the various actors. Mine went very well and I thank God for the fact that I have worked with some very fine physicians that have modeled wonderful, compassionate and human care of patients on the various ICUs that I have worked in. I have been very pensive this week due to the chaos that seems to reign in the halls of Congress in regard to the debt ceiling and intransigence of the members of that esteemed body to bother to work with each other or the President. This evening I went out with my cousin Becky, actually she is my wife Judy’s cousin and works with one of the “Men in Black” law enforcement agencies headquartered in our nation’s capitol. She was with a co-worker who has served at the end of the Cold War in Germany and in the Gulf War and we had a wonderful night talking, eating and drinking good beer at the Rock Bottom Brewery in Arlington. After we were one I had Becky drop me off near the White House because I wanted to wander again about some of the monuments this time with my good camera as I wanted some good pictures from what I observed Tuesday night. Since I have been at the conference or out most of the day I have only heard bits and pieces of the news, just enough to know that the Republicans and Democrats are still driving the train over the cliff even as some in each party attempt to throw the emergency brake to try to stop disaster from overtaking our fragile economy as well as that of the world. The problem as I see it is that a vocal minority is hell bent on forcing their agenda at any cost and sabotaging the cooler heads in their own and the opposition party. Last night I was out and was a bit melancholy as I walked the monuments but came home encouraged by an immigrant cabbie from Morocco who still holds this nation in awe and wonder. It was something that I didn’t expect because it seems that so many of us that have lived here for all of our lives no longer have that sense of awe, wonder and appreciation for this now battered land. I started at the White House and the proceeded past the Washington Monument to the World War Two Memorial, down the National Mall and pat the reflecting pool to the Korean War Memorial, the Lincoln Memorial and the Vietnam War Memorial before walking the 7 or 8 blocks back to the GWU campus where I am staying. Tonight I took my time and did not get back to my room until 1230 AM. I was more deliberate than last night and really pondered then things that made this country great and the sacrifices made by so many that we might enjoy freedom that most of the world cannot imagine. 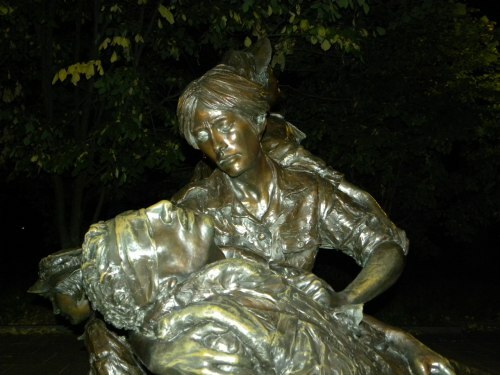 I realized that it was not our economic or military might that made us great but the ideals that this country was founded upon and the sacrifices of men and women of many races and faiths who have each in their own way worked for the cause of liberty many at the cost of their lives in war or sadly in some cases at the hands of their own countrymen. As I settled down and prepared for bed I came across a poem in a book of prayers that Judy put together for my birthday during one of those very lean seminary years. It is by Alan Paton, a South African educator, writer and anti-apartheid activist who died in 1988 five years before the end of that evil system. It is a poem but also a prayer and I think that it speaks as much to me now as the first time that I read it when Judy gave me this gift. Nor defend the poor because of the anger of the rich. Be able to do some work of peace for thee. Amen. I have spent most of the day in some bad physical pain. 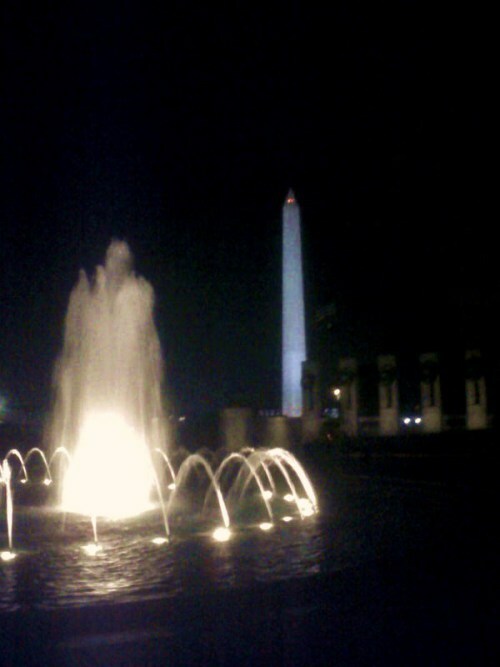 Last night while walking around the National Mall taking pictures I hurt myself. I was walking from the Washington Monument toward the World War Two Memorial looking at the Lincoln Memorial and trying to figure out a good camera angle. I wanted good pictures so instead of walking down either of the sidewalks that line the Mall I wanted to stay in the center which meant walking “cross country” so to speak in the dark. I was sizing up the shot of the Lincoln Memorial while walking forward and I turned briefly to look back to see if I had a good shot of the Washington Monument and the Capitol Dome. As I made this slight turn I found that there was nothing under my right foot and I went crashing down onto a sidewalk about three feet below. I landed on the side of my right leg with the main impact seeming to be at the place where the fibula and tibia come together just below the knee. I felt a sharp pain but got up and limped back to GWU while getting shots of the WWII Memorial, the Korean andVietnamand Lincoln Memorials. I got back to my room in a substantial amount of pain and it took forever to get comfortable enough to get to sleep. When I got up all I could do was hold onto walls as I made my way across the room and put my leg up on the coffee table in the living area. Eventually I made my way over to the conference site where thankfully I was able to keep my leg up most of the day. When the conference was over I changed clothes to meet my friend Pat, a Marine Lieutenant Colonel who I attended the Marine Corps Command and Staff College with and met up with inIraqin 2007. We met at Fado’s an Irish Pub where I had a very tasty Shepherd’s Pie and several pints of Kilkenny Ale which I have not had since traveling in the Mediterranean and the Gulf. On the way there I rode the DC Metro and was very careful to not put any extra pressure on my leg than was absolutely necessary until I got caught in a crosswalk and had to try to run across to beat the light. I am in good physical shape and I figured since I could walk I could probably still run. I was wrong. The first time my right foot hit the ground a shock wave went through my leg with the area that I had injured erupting in pain bad enough to bring tears to my eyes. After dinner I left the Metro station near GWU and stepped off what I thought was a short one step which were actually two steps again landing on my already throbbing leg. I managed to get to my room where after a couple of Aleve tablets the edge is starting to come off of the pain. Tomorrow I will check out of my room and the conference and about 900-930 AM will hit the road out of town. I am in enough pain that as soon as I get into Virginia Beach I will stop at the Navy Clinic at Joint Base Little Creek or the Naval Medical Center to get my leg checked out. While we were talking another stake was placed in the talks to raise the nation’s debt ceiling. I believe that the nation is now being held hostage by a minority of people on the political right and left who have decided it is better for them to destroy the economy of the nation and livelihood of the vast majority of Americans to gain a short term political advantage in the 2012 elections. This is not the first time this national suicide pact has happened. It is now so late and the sides so far apart with such great enmity between them that even if in the now unlikely event a debt ceiling deal is reached the damage is done. Our national credit rating will be downgraded and although the nation will survive life will become exponentially more difficult for most Americans and the chaos will spread around the globe. Back in the late 1920s the radical left and radical right in the German Weimar Republic represented by the German Communist Party on the Left and Hitler’s National Socialist Party of Germany on the Right sabotaged the more moderate politicians of the Center Party and the Socialist Party of Germany. When Wall Street Crashed and the World entered the “Great Depression” the parties of the Left and Right became even more polarized leading President Paul Von Hindenburg to appoint Hitler to form a government. Of course the rest as we historians are prone to say is history. The short sighted policies and actions of the German political parties after the collapse of the Empire eventually brought about the Nazi dictatorship. If our political leaders continue down this path we can expect that the already fragile economy will take a terrible hit. We can expect that many people in the United Statesand around the World will suffer the economic effects of the actions of these so called leaders. As things get worse the extremists in both major political parties aided and abetted by those that think that they can gain by this tragedy will fight it out until one or the other beats the other party into submission. This will not be good and I expect that the pain of what our political leaders inflict on us will be far greater than the physical pain that I feel now. God help us all. On Wednesday night I took a walk about our Nation’s Capitol. It was a beautiful night and the buildings and monuments were illuminated in the most spectacular ways. It was inspiring in a sense to see them, symbols of the greatness of the country and the people how sacrificed themselves to build it. I can understand why so many millions of people have come to this country from all over the world to become Americans and be part of our dream. In fact I became so engrossed I taking pictures that night that in the darkness I did not see an unilluminated ledge not far from theWashingtonMonument. I fell from it onto the waiting sidewalk below and crunched my right leg pretty bad. I had it checked out and x-rayed at the Naval Health Clinic at Joint Base Little Creek when I returned to Virginia. The doctor assumes that there is a good chance that I have a hairline fracture of either my tibia or fibula just below the knee and I am being referred for further tests when I return to Camp LeJeune Monday. Until then I am on crutches and pain meds. I fell over the ledge that I had no idea was where it was. It was inadvertent and even when I got up and looked at it I had a hard time making it out. However there are those in the country including many in the political leadership and media that seem to want us to go over a cliff because they perceive that it helps them and their agenda. They see the ledge and they know the danger but they unfortunately enabled by “we” press on to the abyss. For many years the political ideologues on the extremes of the Left and the Right in the United States have harbored the worst thoughts about those that do not match up with their ideologies. I have been writing for quite some time about how divided our body politic is and how dangerous the situation has become. The contemptuous thoughts of the Left for the Right and Right for the Left first turned to words and those words became commonplace, so common that they became habitual. In a sense they have become part of the political DNA of the most extreme among us. The attitudes that we have formed and angry words which we now use so ubiquitously are reflective of a deep hatred that now is becoming what defines us as a people. In fact the deep and abiding hatred which now permeates our society is now threatening the international standing and I would say the national security of the United States. We have only ourselves to blame because through our actions and inactions of the past decade we have made our choice to be what we have become and there is no one group especially in our political, media and business elites that have served us well. In fact we have as voters chosen this toxic mix of elected officials often more influenced by hate spewing pundits and our own self interests rather than that of the nation and future generations much as we would like to claim that we are looking out for the future. We have chosen badly and we are paying for it. We are being held hostage by those that we elected, men and women who supposedly know better than to destroy the country in order to save it as was about the village of Bien Tre in the Vietnam War… “we had to destroy the village in order to save it.” The Left and right have racked up massive debt over the past decade which has made previous debt pale in significance. Each like to blame one another as “mostly to blame” but each has a major part of the responsibility for the mess that we are in. However the amazing thing is that neither side nor we the electorate seems to be able to hold ourselves responsible. Without going into the whole debt ceiling debacle which now has us on the edge of a default which we can only pray will not be as bad as real economists around the world say it will be; the fact is that we have made the mess and now our leaders are failing us. I have to say that all of them have used this made up crisis to some extent to further their goals and agendas at the expense of the country. That is a shame and our elected leaders of all parties and factions are at fault and it comes back to character, theirs and ours. You see it is about more than the budget or the debt ceiling. It is about hatred of fellow Americans which has been preached by hypocritical ideologues for decades on the radio, television and now the internet. Much of it is as raw, hateful and disingenuous propaganda disguised as “news” as was Julius Streicher’s Nazi Der Sturmer and the Communist Party Die Rote Fahne were in Weimar Germany. That poison has infected us and most of us line up on one side of the propaganda machine or the other. We know what happened to the Weimar Republic, racked by bills it could not pay, massive unemployment brought on by the Great Depression and a desperate population led by politicians that intentionally used their misery to derail the efforts of government after government to try to manage the crisis. They ended up with Hitler, the head of a large and vocal political movement which refused to compromise with anyone to bring down the Republic that they hated. Whatever happens in regard to the debt ceiling and future budget negotiations the damage has been done. The soul of our nation and our national character has been damaged perhaps irreparably. Our leaders hate each other and the most influential media in the country, the talk radio and cable news pundits of all stripes throw gasoline on the fire every day. The social and political anarchy will reign until one side or the other has crushed their opposition. Those in the middle lose either way as they will be crushed by whichever side wins unless they ally themselves with the winning side no matter who it is. History teaches us that such times are at best tumultuous and at worst cataclysmic. The consequences when great nations engage in such political fratricide it usually has grave consequences that effect it as well as nations and peoples far beyond its borders. It is time for everyone to take a step back from the abyss before we plunge headlong into something that we will regret which will only benefit those that seek to benefit from it. Or are we too stupid to see what is happening? Thoughts, words, habits, character….be careful. The news is abuzz tonight about the bi-partisan deal that has been agreed to by the President, the Speaker of the House and Majority Leader of the Senate. The details will come out but certainly there will be those unhappy with the deal. I don’t know what is in it and the devil is always in the details. I am a realist and the details seldom bode well. Like John Buford a career Officer during the Civil War I have become disgusted and worn out watching the men and women that we have elected to public office work so hard to fracture this country that I hold so dear. The battle lines are still drawn and the language except for the utilitarian language that compromise was necessary to stave off a default has not changed an iota. The language of compromise does not sit well with the most vocal members of the Tea Party faction nor those on the hard Left. Many Tea Party leaders and members continue to argue that their leadership to push the government into default to achieve their goals. We have crossed the Rubicon and unless an external and existential threat to our nation forces our leaders to work together I seriously doubt that this will end well. The President failed to lead when he had a super-majority and his allies in Congress squandered the chance that they were given in 2008. The Republicans after taking the House in 2010 are doing the same. Neither side will admit to their behavior. Both will with good reason to point the finger of blame at their opponents while ignoring their own contributions to this sordid state of affairs. I can see it as if has already happened. The Unholy Trinity of politicians, pundits and preachers will step up their rhetoric inciting their followers to adopt even more uncompromising positions. The already fearful enmity will deepen and the center will disappear. Emotion in the form of hatred will drive the arguments that neither side will listen to even as the United States and the world economy worsens and the wars continue. Young Americans will give their lives in Iraq and Afghanistan even as their political leaders on both sides of the aisle seek ways to reduce the force and even the pay and benefits that they have earned after 10 years of unending war that the rest of the nation while seemingly grateful does not understand nor share. “We few, we happy few…” William Shakespeare quotes Henry V before the Battle of Agincourt. Tonight I have been watching the movie Gettysburg which I think is a fitting reminder of what happens when the Unholy Trinity finally achieves their goal of destroying the very fabric of the nation and pits brother against brother. Hopefully cooler heads will prevail and somehow, some way we will get through this before we long for the day that makes what we are experiencing now look good. I believe that Thomas Jefferson in describing the results of the Missouri Compromise aptly describes the mood of our times and the consequences of politicians that lead us to the dark abyss of hatred and civil war. There are times that I wish that I was not a historian or theologian for then I could simply be ignorant of the place that our elected leaders are leading us. But we have no one to blame but ourselves. We voted them all into office and we have encouraged their repugnant behavior with our votes which more often than not were purchased by the fear mongering engaged by each side and our desire to have our special interests and or ideology come out on top. We have been engaged in what conservative columnist Pat Buchanan declared a “culture war” for the past two decades and wars be they cultural, ideological, and economic or military have consequences. The longer they go on the worse and more violent they become until one side finally loses and the landscape is destroyed. A conservative German newspaper noted “It is this war-like rhetoric that has so poisoned American politics.” The Germans should know something of this. The “Kulturkrieg” and the violent hatred of their countrymen in the wake of the defeat of the First World War and humiliation of Versailles brought about civil war. The pursuit of radical ideologies in the following years is what doomed the ill-fated Weimar Republic when the economic calamity of the Great Depression struck and led to the tragedy of the Nazi takeover and ultimately led to World War Two. The sad thing is that there is so much work that has to be done and it is more than reducing Federal Government spending. Our industries have been shipped wholesale overseas using the treaties that business has foisted upon their willing accomplices in both parties in the name of “free trade.” Our unemployment continues to rise and many economic experts believe that we are entering a “double dip” recession which some believe could easily become a depression. The infrastructure of the nation crumbling with the businesses that benefit from them refusing to contribute to their maintenance unless they receive government contracts and money in return. We are committed to long term ground wars that have sapped the economy and worn out the military which now seem to serve little strategic purpose. In fact the position of the Army in Afghanistan could be disastrous if Pakistan decides to stop cooperating and not allow us to supply the Army through it. It is apparent to me that those that can afford it the least and the military will bear the brunt of the cuts that will come and that it will be a long time before this crisis passes. No one seems to be addressing the major issue of unemployment or economic growth without which there is no recovery. I heard the President and Senate Majority Leader McConnell repeat what they have said for years but no plans and no action. As for the military we are worn to a nub, our equipment needs to be replaced and modernized and our troops still deserve the best that we can give them, but even this is on the chopping block, military retirement is called “an expensive entitlement program” by those advocating that the military adopt a private sector pay and benefit plan of little value especially to those that have spent 10 years at war paying with their minds, bodies and spirit fighting wars that the Wall Street bunch has benefited from, the same Wall Street leaders that now call for reductions in military pay and benefits. It is obscene. I would like to believe that this is a rough patch that we will get through, but right now with the terrible acrimony present in Washington and all the State Capitols I have a hard time believing that we will. The President has failed to enunciate any kind of plan or vision and the Tea Party leadership is acting like the Jacobins in Revolutionary France. I have no idea who will “win” this “culture war” and does it really matter? The result will be a Pyrrhic victory with the winners celebrating on the ruins of the country. I only know that we all lose.